Accessible Parking is very limited, (supporters are advised to contact club reception for availability). Accessible Entrance to all stands is through the accessible gate to the Big Bank Stand via Stadium Way, it is fairly level and ramps are in use within the Stadium. There is an accessible entrance for Away supporters in St James’ Road to allow entry to the Main Stand and Away Terrace. 41 (57 if needed) Home Supporters: 1 area in the Main Stand (covered & elevated), 3 areas in the Big Bank Stand (all elevated but only 2 are covered), 4 areas in the Stagecoach Stand (1 elevated & 3 at pitch level). NOTE: When demand is greatest, 16 more spaces will be provided in the front row of the Stagecoach Stand (all pitch level). This gives 57 spaces for home supporters, if and when needed. Waterproofs are available to those supporters using area 1 in the Big Bank. Ask nearest steward if required. 8 Away Supporters: 1 area in Main Stand (Area L – 3 PA seated spaces – covered & elevated), 1 area in St. James Rd Stand (5 PA standing spaces – covered & pitch level). Personal Assistants are seated within designated areas. Ambulant Disabilities: Unlimited places. Seating is arranged in relation to mobility difficulties. Blind and Partially Sighted : Unlimited places, Personal Assistants are seated adjacent. Dedicated commentary service: 10 headsets in total available for Home & Away supporters. Supporters wishing to use the commentary service are advised to contact club reception for availability and to reserve a headset. Deaf and Hard of Hearing : Unlimited places. On request, a Portable Induction Loop is available for use in the club shop and reception. Assistance Dogs: Assistance dogs are admitted to the ground. The Club’s Stadium Manager or Disability Liaison Officer should be contacted in advance for all relevant information. The Policy on Assistant Dogs can be found below on this page. Designated Disability Steward: To assist home and away supporters with disabilities. The club has an assistant wheelchair available for hire on match days for those supporters who have a need of a wheelchair because of a temporary disablement. Anyone requiring the use of the assistant wheelchair is advised to contact club reception for availability. 5 adapted toilets in total. 1 in corner of Big Bank Stand / Stadium Way Entrance; 1 plus 1 Changing Places room in the Stagecoach Stand (supporters are advised to bring their own sling for the portable hoist) & 2 in ‘The Park’. All equipment in the room is used at the supporters’ own risk. Areas are stewarded with Radar locking key systems in use. Catering Facilities: Available. However, only the Stagecoach Stand is dedicated at this time. For reasons of Health and Safety, wheelchair users are asked to be accompanied by a personal assistant. Supporters requiring access to accessible wheelchair areas and all those others with disabilities are advised to purchase tickets in advance if they do not hold a season ticket as the club. Tickets can be bought over the telephone or via the clubs online ticketing service. Has accessible facilities which includes toilets with radar key locks and lift. From M5: Exit M5 at junction 30, and then follow signs for Middlemoor. Take 2nd exit at Middlemoor roundabout (signed Heavitree), Follow signs City Centre, going through Heavitree (Approx 2 miles) passing the Police Station on your right, at roundabout take 4th exit onto Western Way (signed Pinhoe and Broadclyst). At next roundabout take 2nd exit into Old Tiverton Rd, take 2nd left into Stadium Way for St James Centre/Centre Spot. From East: Take the A30 towards Exeter, Follow the directions ‘From M5’. From West: Follow the A38 towards Exeter, joining the M5 North at junction 31. Leave at junction 30 and then follow the directions ‘From M5’. Nick Saunders (Disability Liaison Officer). Exeter City Football Club has an Equal Opportunities Policy and opposes all forms of unlawful or unfair discrimination on the grounds of disability. We encourage the inclusion of all supporters with disabilities and welcome their involvement. The Club is committed to taking a proactive approach to ensure that the needs of all supporters with disabilities and visitors are met as the Club recognises that not all of its facilities are fully accessible to supporters with disabilities and visitors. The Club confirms that it is committed to making the necessary reasonable adjustments to all the services provided by the different departments of Exeter City Football Club. Access to goods and services, as well as match day facilities are being fully assessed and a programme of measures in place to ensure compliance with all associated legislation. The Club operates a specific non-discriminatory ticketing policy for supporters with disabilities and will ensure that the scheme does not differentiate between all the different disability groups. Where charges are made, the charge will be made to the person with the disability. This is in line with current “disability etiquette” which maintains that people with disabilities should be treated the same as any non-disabled person or in this case spectator. Where Health and Safety requirements demand that a person with a disability has to be accompanied by a personal assistant, that assistant will be given free entry to matches where the Club allows free admission. Please note if the person with the disability cannot attend a match, their personal assistant will only be allowed access provided they pay for a full price ticket. The Club reserves the right to ask for ‘proof of disability’ before issuing any concession under the Disability Discrimination Act 2005 (DDA), which was replaced by the Equality Act 2010. However, the Disability Equality Duty in the DDA continues to apply. Receipt of the Standard or Enhanced rate of the Personal Independence Payment (PIP), (daily living or mobility component). Receipt of the middle or higher rate of the Disability Living Allowance (mobility or care component). Receipt of either the Severe Disablement Allowance or Attendance Allowance. A personal letter from a GP. possible reasonable adjustments the Club concludes that it is unable to provide a space, then priority consideration will be given when a space becomes available. Opportunities for supporters with disabilities to attend away matches are limited by the allocation received from the away club. The Disability Liaison Officer or the clubs Ticket Office will carry out co-ordination of the sales of these tickets, when needed. As a fundamental principle, the Disability Discrimination Act 2005 (DDA) stated that disabled people should not be treated ‘less favourably, without justification’ and ‘reasonable adjustments should be made to make goods, facilities and services accessible’. Exeter City Football Club aims to comply fully with both the spirit and provisions of the Disability Discrimination Act 2005 and the Equality Act 2010. Any person who, because of their disability is unable to use ordinary stand seating without contravening Health and Safety Regulations, Guidelines or Policy or where the Club has provided a ‘reasonable adjustment’ to enable that supporter to attend the venue. Any such person will be considered for use of the designated areas of the stadium in line with the procedures set out in this policy. A ‘designated area’ is any area (including specific seats within the stadium) that the Club shall at its sole discretion determine as being available for those with disabilities at a concessionary price. A ‘reasonable adjustment’ in this context shall include (but is not limited to) the need to use a wheelchair bay or the need to bring a personal assistant. The Club’s Disability Liaison Officer works closely with the Operations Manager and advises the Club on issues which are of particular concern to supporters with disabilities. Supporters who are deaf or hard of hearing can be accommodated in the stadium by various means. who is fully able to support their needs in the event of an emergency, unless said person has an Assistance Dog and in this case the Club’s Disability Liaison Officer should be contacted in advance for all relevant information. The Club is able to accommodate supporters who are blind and partially sighted in all parts of the ground but the club recommends that the blind or severely partially sighted person attending a match at St James’ Park be accompanied by a personal assistant who is fully able to support their needs in the event of an emergency, unless said person has an Assistance Dog and in this case the Club’s Disability Liaison Officer should be contacted in advance for all relevant information. On match days, information will be carried via the public-address system. The club has a dedicated Descriptive Commentary Service for those who are blind or partially sighted with 10 headsets in total available to both Home & Away supporters. Those wishing to use this service are advised to contact Club Reception in advance for availability. 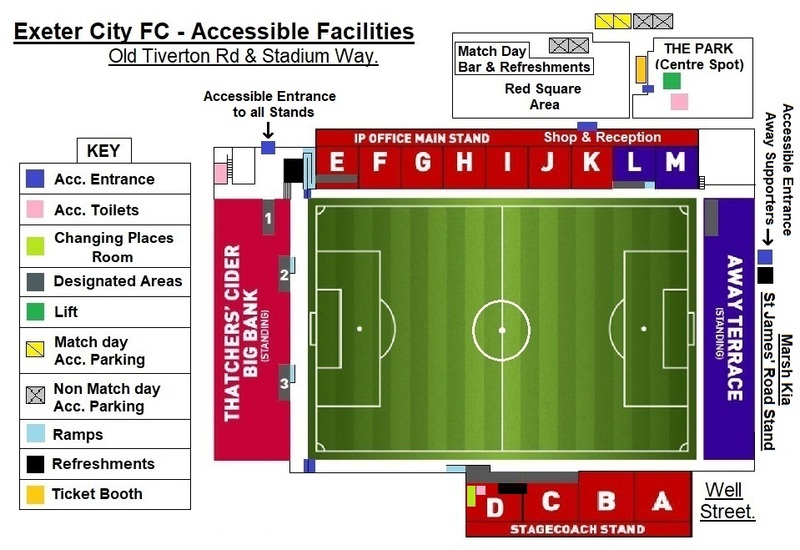 Exeter City Football Club has a limited number of spaces for wheelchair dependent supporters and their personal assistant in all parts of the ground. The Club wishes to make the most appropriate use of these facilities by providing them to those with disabilities who are unable to sit in any other part of the stadium. Wheelchair using applicants must be largely dependent on a wheelchair for mobility purposes or not capable of walking a distance further than that required to reasonably and safely access any other part of the stadium. Wheelchair dependent applicants of either manual or powered wheelchairs are encouraged to be accompanied by a personal assistant who is capable of supporting their needs in the event of any emergency evacuation, unless said person has an Assistance Dog and in this case the Club’s Disability Liaison Officer should be contacted in advance for all relevant information. The Club would not refuse admittance to those who don’t bring a personal assistant; any refusals will only be on the grounds of a contravention of Health and Safety legislation. Designated areas for wheelchair dependent home supporters are located in the Main Stand = 4 spaces; Big Bank Stand = 21 spaces and Stagecoach Stand = 16 spaces (When demand is greatest, 16 more spaces will be provided in the front row of the Stagecoach Stand). There are 2 designated areas for wheelchair dependent away supporters located in the Main Stand = 3 spaces (PA seated). Away Terrace = 5 spaces (PA standing). All areas in the Main Stand/Big Bank Stand are raised and covered with the exception of designated bay 1, which is uncovered with waterproofs provided when needed for said bay. People wishing to apply for season ticket places in the designated areas should contact the Club. Wheelchair dependent supporters who require tickets for a designated area are encouraged to purchase tickets 48 hours in advance. The club have wheelchairs for hire for those with a temporary disablement. Those wishing to use this service are advised to contact club reception in advance for availability and hire. learning difficulty feels that ordinary stand accommodation would be unsuitable for them, they should contact the Club for further information. Supporters with learning difficulties can normally attend games by themselves. However, if for whatever reason this is not the case, we encourage these people to be accompanied by a personal assistant who is capable of supporting their needs in the event of any emergency evacuation. Supporters with ambulatory disabilities who require seats in appropriate areas are encouraged to purchase tickets 48 hours in advance. It will also be necessary for the ambulant supporter to provide qualifying documentation relating to their condition in order to qualify for a personal assistant ticket, if a personal assistant is required. The Club also recognises that people with disabilities have families and indeed may wish to attend a match as a family and therefore the Club will provide designated ambulatory seats for families on request within the Family Stand. Tickets for such seats should be purchased 48 hours in advance. Supporters with certain conditions can sometimes have difficulty in accessing seats in some parts of the Stadium. 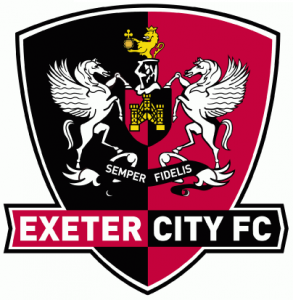 Exeter City Football Club recognises that elderly people now form a larger part of the population than younger people and the Club wishes to make sure that our elderly supporters are able to continue to attend matches whenever possible. The Club therefore recognises that some of its longest serving supporters with infirmities may require seating in an appropriate area of the stadium. Supporters with infirmities who require seats in appropriate areas are encouraged to purchase tickets 48 hours in advance. Assistance dogs are admitted to the ground. The Club’s Disability Liaison Officer should be contacted in advance for all relevant information. Measures will be taken to ensure that the welfare of the Assistance Dog is preserved. The club does have a separate Policy for Assistance Dogs. Exeter City Football Club has 2 accessible spaces allocated to its supporters with disabilities. These are allocated to supporters with the most severe mobility difficulties, which is through a season permit. Applications/requests should be made to the Club on a seasonal basis and each request will be judged on its individual merit. The Club would ask that people recognise that there are only a limited number of places available and it will not be possible to accommodate everyone who has a Blue Badge. Home supporters given an Accessible Parking Permit are expected to display their Blue Badge and Permit at all times. If there is no Blue Badge and Permit on displayed, then parking will be refused. There is 1 accessible space reserved for away supporters, booking of this space is by contacting the Club up to 24 hours in advance. After that time, unallocated space will be released to a Home supporter. Away supporters will be expected to have their Blue Badge on display at all times. If a Blue Badge can’t be produced, then parking will be refused. There are council run car parks situated close to the ground which are free to those with a Blue Badge. However, there are also car parks that are chargeable. Those unable to walk far, there is a drop-off-point at the bottom of Stadium Way close to the accessible entrance to St. James’ Park. There are 5 adapted toilets in total. 1 in corner of Big Bank Stand / Stadium Way Entrance; 2 in the Stagecoach Stand (changing places room can be used as an accessible toilet also) and 2 in ‘The Park’. The Changing Places Room is located in the Stagecoach Stand, in this room is a Changing Bench; a Portable Hoist (supporters are advised to bring own sling for hoist); a showering area and Privacy Screen. All equipment in the room is used at the supporters’ own risk. Areas are stewarded with Radar locking key systems in use. Match day catering is provided within the stadium. However, certain areas of the stadium do not have catering facilities suitable for those with mobility difficulties and it is therefore advised that for these particular areas, supporters with disabilities either bring along a personal assistant or notify the nearest steward who will be happy to provide assistance. Other facilities, which come under the general heading of catering such as bars, executive lounges, boxes etc., are accessible to people with disabilities by means of a lift. In these areas’ waitress service is provided. Steps have already been taken to put procedures in place to provide information in formats that are more easily accessible to people with disabilities. Information leaflets are available in large print, electronic format and audio versions are available on request. The official Exeter City website (http://www.exetercityfc.co.uk/) is operated by EFL Digital Limited (Company Number 04112553). They consistently monitor the levels of compliance against the Equality Act 2010, as well as working on an individual level with a number of fans with disabilities to deliver best practice across the network of Official Football sites. Elements of staff training that relate to ‘disability awareness’ and ‘disability etiquette’ have been identified and a training programme is in place to ensure that awareness and etiquette are observed. This training programme will be on going. Inclusion & Anti-Discrimination (Equality and Diversity) staff training is also undertaken under the banner of ‘Playing for Inclusion’ provided by the English Football League ‘EFL’ as part of the Club’s Code of Practice. Exeter City Community Trust delivers regular coaching sessions for young people and adults with disabilities across a range of footballing activities. This policy was approved at a meeting of the Board of Directors held in December, 2018 and will be reviewed again in July 2021. Exeter City AFC Ltd values the diversity of its employees, visitors and supporters and is committed to providing an environment which is welcoming for all. The Club provides information for its staff, visitors and supporters and this policy has been developed to address specific issues relating to assistance dogs on Exeter City premises/grounds. It is also intended to raise awareness for staff, visitors and supporters of the issues relating to assistance dogs. the arrangements made to provide a welcoming and safe environment for assistance dogs and their owners. the roles and responsibilities within Exeter City AFC Ltd in relation to assistance dogs. the responsibilities of the owners of assistance dogs on Exeter City AFC Ltd grounds. a process for dealing with issues and complaints if they arise. More information on the definition of an assistance dog, as used in this policy, can be found in Appendix 1. Water bowls are provided for assistance dogs (for further information contact: disability@exetercityfc.co.uk). On request, Exeter City AFC Ltd will provide familiarisation with and orientation of club grounds. The club provides guidelines for staff on how to interact with assistance dogs. This information can be found in Appendix 2. The club is happy to listen to the suggestions of assistance dog owners as to how the clubs provision for assistance dogs could be improved. The disability liaison officer or relevant member of staff is responsible for informing other staff, who are likely to come into contact with the assistance dog and for asking them to confirm that they would not be adversely affected by the presence of the dog. The club will ensure that staff and stewards will be provided with training, so that they can respond appropriately to individual needs. Grounds or Estates staff will ensure the upkeep of Spending Pens to ensure the health of the dog and the safety of the owner, including the provision of bins for dog refuse and the disposal of the refuse. The disability liaison officer or relevant member of staff will advise employees, visitors and supporters with assistance dogs and signpost them to this policy to make them aware of the help provided by the club and their rights and responsibilities. If required, the disability liaison officer or relevant member of staff will liaise with the grounds or estates staff to ensure that any reasonable adjustments needed have been made. The operations manager will ensure that staff with an assistance dog are aware of this policy, including their own responsibilities and will work together with the member of staff to arrange any reasonable adjustments required. The operations manager will also ensure that other members of staff respond appropriately to the member of staff and the assistance dog. Grounds or estates staff will provide support to the operations manager in addressing any issues that arise. is kept on a lead at all times when walking around the club premises/grounds. uses the Spending Pens provided by the club and does not allow it to foul on club paths or grounds. has its requirements in relation to toileting and feeding requirements met. In the unlikely event that the dog does foul inside club buildings, the owner must report this to an appropriate member of staff to make arrangements with grounds or estates management to clean and sanitize the area. Process for dealing with complaints and/or breaches of the policy. If a member of staff, visitor or supporter with an assistance dog wishes to make a complaint about the treatment of themselves or their dog, they should raise this issue with the clubs operations manager. Every attempt will be made to resolve the matter informally, including where appropriate the use of mediation. If the matter cannot be resolved informally, the issue will be escalated and dealt with through staff disciplinary procedures, with reference to the Equality Act 2010. If a member of staff, visitor or supporter wishes to make a complaint about an assistance dog or notices any breaches of this policy, they should also raise the issue with the clubs operations manager. Again, every attempt will be made to resolve the matter informally with the dog’s owner, including where appropriate the use of mediation. If the matter cannot be resolved informally, or if the request to resolve the complaint is not complied with, the issue will be escalated and dealt with through staff disciplinary procedures. Complaints about the operation of this Policy should be made to the clubs operations manager. For the purpose of this policy, an assistance dog is one which has been specifically trained to assist disabled people and which has been qualified by one of the organisations registered as a member of Assistance Dogs (UK) or an equivalent organisation in another country. Assistance dogs trained by members of Assistance Dogs (UK) or by an equivalent organisation in another country, have formal identification and are permitted to accompany their owners at all times and in all places within the United Kingdom (unless there is a genuine health and safety risk). Is not qualified by one of the seven membership organisations of Assistance Dogs (UK). Dogs from other nations, which do not meet the full membership criteria of the established international assistance dog organisations – Assistance Dogs International, Assistance Dogs Europe, International Guide Dog Federation – or other such international bodies as may from time to time be recognised. Guide Dogs: for adults and young people who are blind or partially sighted. Identification: Qualified guide dogs wear a white harness with yellow fluorescent strips. Hearing Dogs: for adults with a hearing impairment (aged 17+) and for children with a hearing impairment (ages 7-12). Identification: Qualified hearing dogs wear a burgundy jacket. Dogs for the Disabled: Assistance dogs for children with physical disabilities (Age7-16) and for adults with physical disabilities (Age 17+).Assistance dogs and other services for families with a child affected by autism (age 3-16) The charity also runs a non-assistance dog programme called PAWS working with families with children with autism who have, or want to acquire a pet dog (see website for details). Identification: Qualified disabled and assistance dogs wear a fluorescent yellow jacket. Autism assistance dogs wear a blue harness. Canine Partners: Assistance dogs for adults with physical disabilities. Identification: Qualified canine partners assistance dogs wear a purple jacket. Support Dogs: are trained to do many tasks, which their owner may find difficult or impossible or disability assistance dogs for people with physical disabilities (client-owned dogs specifically trained to meet their owner’s needs). Autism Assistance dogs for children with autism are trained to do many other tasks, which their owner may find difficult or impossible or disability assistance dogs for people with physical disabilities (client-owned dogs specifically trained to meet their owner’s needs). Seizure Alert Dogs for people with epilepsy. Autism Assistance dogs for children with autism. Seizure Alert dogs are trained to behave differently when they detect a potential seizure, which may appear to be misbehaving. Identification: All the above qualified support dogs wear a blue jacket. Dog A.I.D: Volunteer trainers supplied to help physically disabled clients train their dogs to assistance level. Identification: Qualified Dog A.I.D. assistance dogs wear a red jacket. Medical Detection Dogs: Medical Alert Assistance Dogs for adults and children who manage complex health conditions. Dogs are trained to identify the odour changes that are associated with life threatening medical events. Cancer & Bio-detection Dogs detect cancer volatiles in urine and breath samples. These specialist dogs provide valuable data to assist in the development of new ways to detect and diagnose cancer. Identification: Qualified dogs wear a red jacket. Membership of Assistance Dogs (UK) is open to organisations that are accredited members of Assistance Dogs International (ADI) or the International Guide Dog Federation (IGDF). • Talk to the handler, not the dog! It is very frustrating for a person to have to interrupt your conversation with their dog. Likewise, if you are helping a person with a guide dog to get somewhere, give the person directions or talk with the person as they follow you. They will give the dog the correct commands for following you. Please do not call the dog. The dog is used to working for the disabled owner. If it is responding to you, it is no longer focused on their needs but on you. • Do not pet or praise the dog without asking first, please! It can be very dangerous for the handler if their dog is distracted and not doing its job. It is important to remember that while they are extremely intelligent, devoted, and highly trained, service dogs are still capable of acting upon natural instincts and may display the same behaviours as other dogs from time to time. Guide dogs sometimes scavenge for food, get distracted by other animals, experience fear, and forget about their work when tempted by things they like. People’s attention can be especially alluring. Praise is a reward for service animals, and people who work with the dogs provide it when it is appropriate. Sometimes it is given quietly in small doses; and at other times it is given lavishly. If another person says, “What a good dog,” in passing, the person may have just rewarded the dog, without knowing it, for something the dog did just before the person arrived that was dangerous to the user. When admiring a service dog, it is best to keep eyes averted, comments directed to the user, and voice modulated appropriately (e.g. do not speak as if addressing a child or use an especially sweet-sounding voice, as this will draw the dog’s attention). Don’t feed the service dog. Many – not all – service dogs are on strict, healthy diets to keep their working lives long, and they may also have allergies that you are not aware of. It also can break the dog’s training if they learn that they get food in a public place.